The photos below may be enlarged by clicking on the photos. For further enlargement click again. There have been two sloops and one screw frigate of former times bearing the name of "Dauntless," the first sloop being captured by the French in 1807, while the second sloop (1808-25) and the frigate were sold by Admiralty. 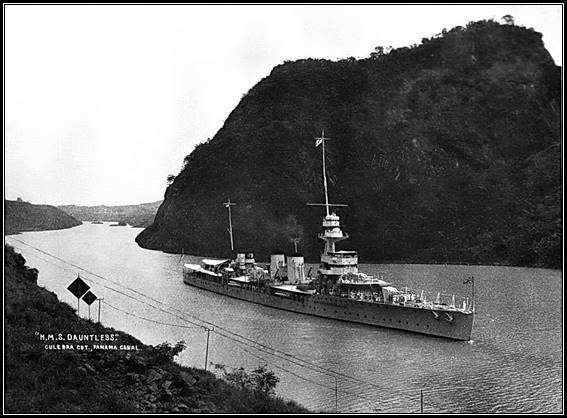 The present light cruiser is of 4,650 tons with a horse­power of 40,000. Her armament consists of six 6" guns, three 4" H.A. 's, four Hotchkiss 3-pounders, two pom-poms and twelve torpedo tubes. She was launched in 1918 for service in the Atlantic Fleet, her activities including her part in the bombardment of Reval, since when she has made a world cruise, con­tinuing with service on the Mediterranean and China stations until 1928, when she became attached to the America and West Indies squadron. She was re-commissioned at Portsmouth on 27th July, 1932, for further service on the South American Division of the station, and commanded by Captain C. 0. Alexander, R.N. During the commission to which this book refers, H.M. S. Dauntless has covered most of the ground from Palestine to Patagonia and Port Said to Panama. The number and variety of places visited must be almost unique, and the book must of necessity omit much of interest. It will, however, serve as a diary and guide to which we can add our personal experiences and adventures for the benefit of our friends at home. Those who have kept their eyes and ears open cannot fail to have broadened their outlook on life and benefited from the experience. Throughout the commission our record, both at work and play, has been one of which we may feel justifiably proud. I also hope that all will agree with me that the commission has been a ‘happy’ one and that the Dauntless spirit will follow everybody in their next ships. In the Service, one is accustomed to visiting foreign countries and making new acquaintances, but the more one does it, the more one realises how very few others are really interested in these experiences afterwards. If this book were merely a humdrum account of a perfectly ordinary commission, one could not expect anybody, apart from those directly concerned, to find any excuse for its conception. There are, however, several unusual features to justify the contention that the book is worth reading. Of these, the exceptional area covered by the ship in the two and a half years under review, the variety of places and peoples visited and the abrupt changes which had to take place in the ship's company's mental outlook, all tend to raise the interest of the commission above the average. As an illustration of the first feature we might give lengthy statistics of the enormous distance covered. 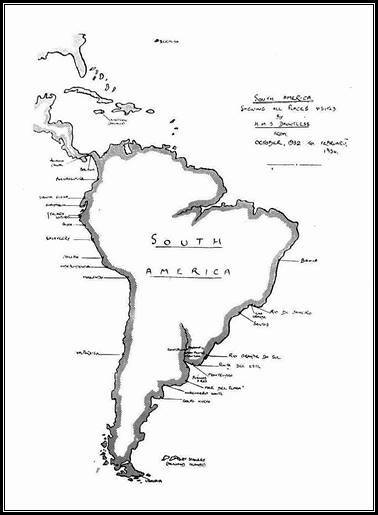 But mere distance in itself is, next to Sunday Divisions, probably the most boring part of Service life, and one must qualify it by pointing out that, in our case, the cruises included all the East and West Coast Republics of South America as well as nearly all the Mediterranean countries. The third point is well exemplified by the sudden change from South America to the Mediterranean, from an isolated cruiser, organized for ‘Flag Showing,’ to a unit of the Mediterranean Fleet, where the importance of firing off the cannon in the right direction outweighed all other considerations. As regards the book itself, the intention at the outset was that it should consist of contributions from all parts of the ship, compiled in narrative form, so as to give a representative picture of life on board throughout the commission. Due to lack of suitable material, this was found to be impracticable, so a compromise was attempted, of which this book is the result. The thanks of the Editor are due firstly to (O.S.) A. E. Charman, who produced almost all the material dealing with South America. Unfortunately, Charman had to leave us at Gibraltar, and so was not able to finish off the work, which he had begun so well. The Editor was, however, fortunate in finding a very able successor to him in the person of (S.A.) F. W. Adcock, to whom the credit is due for the latter part concerning our cruises in the Mediterranean. Many people have contributed to the book. Amongst these must be mentioned Leading Writer A. F. Brown, who produced the Sports Section and helped generally. Others volunteered short articles and sketches. As regards the latter, it is to be hoped that those artists, whose masterpieces have not been included, will not bear any malice. In several cases the subject matter was just a little too light-hearted, thereby forcing the Editor, in spite of no small personal enjoyment, to decide, with much regret, against their inclusion. In other cases, the difficulties of printing or the impossibility of remembering to what incident the sketch referred, necessitated the same line of action. At all events, whatever one may think of the book, the Commission itself was a successful one and those who took part in it will look back on their time in Dauntless with genuine regret. Commander G. H. Faulkner, D.S.C. Lieutenant Commander R. St. V. Sherbrooke. 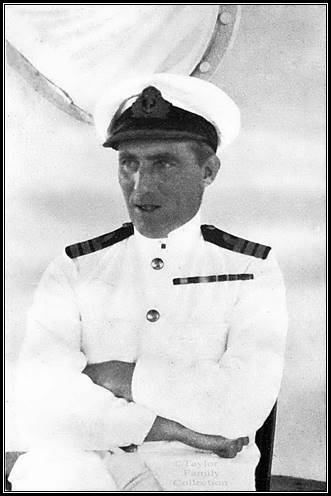 Lieutenant Commander J. S. C. Salter. Lieutenant Commander H. G. Dickinson. Lieutenant Commander F. M. Beasley. Lieutenant H. E. F. Tweedie. Lieutenant A. J. R. White. Commander (E) H. F. Fellowes. Commander (E) A. J. Norris. Lieutenant (E) W. M. Gibson. Lieutenant (E) E. D. Michell. Lieutenant (E) 0. P. Tilden. Captain R.M. R. C. Giles. Instructor Lieutenant J. H. Cooke, B.Sc. Paymaster Commander A. E. A. Eager. Paymaster Commander B. S. Rea, M.B.E. 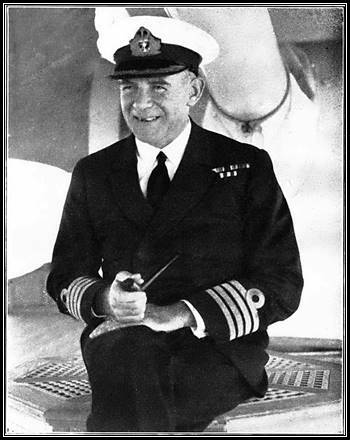 Surgeon Lieutenant Commander J. J. Keevil, M.B., Ch .B. Sub Lieutenant G. M. Onslow-Ford. Paymaster Sub-Lieutenant T. G. P. Luxmoore. Commissioned Gunner A. E. A. Goldfinch. Commissioned Gunner F. M. Goodger. Warrant Engineer F. J. Doy. Warrant Engineer L. A. Rogers. Warrant Shipwright J. H. Cook. Commissioned Gunner M. W. Sonnet. Schoolmaster. R. B. Hollis, B.Sc. Midshipman M. J. P. Walters. Paymaster Midshipman G. V. King. While preparing this article we received the following correspondence from Chris Hammond a collector and enthusiast in the UK. The pictogram in question appears below. I bought this framed photogram at a local auction and whilst researching it came across your internet pages. I think you may well be interested in it. I believe it would have been produced on board by the photographic section on board and sold or given to ship’s crew as a memento of the cruise. 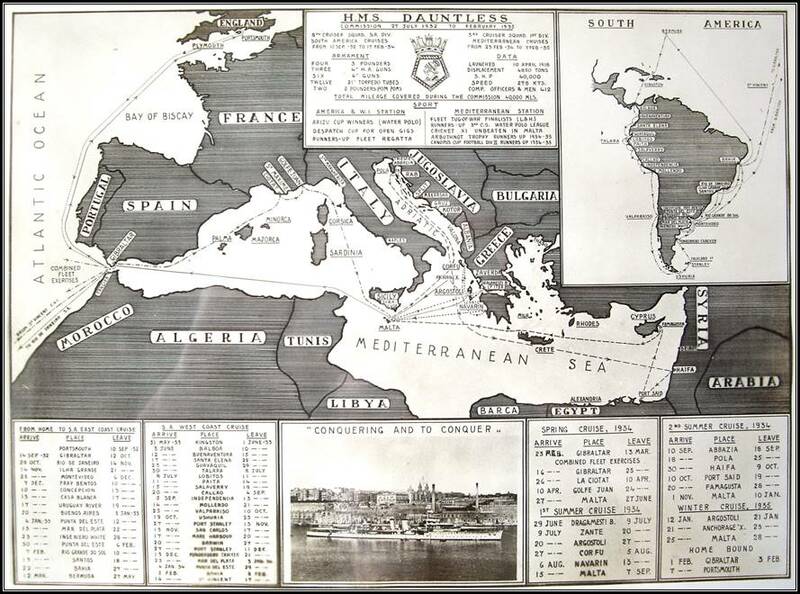 It covers the period September 1932 to February 1935, 6 trips in the Med. and South America, even covering the crews sporting victories.